Eastwood’s Tilt-A-Car System offers a simpler, more portable — and cheaper — alternative to installing a lift in your garage. Sure, it looks like a human-sized drop trap, but it’s also a great way to work on the underside of your car. Eastwood claims the Tilt-A-Car will tilt a car or truck up to 6,800 pounds all the way to 90 degrees. Two rocker assemblies attach to the wheel lugs on one side of the vehicle while a threaded lift screw connects to the lugs of a wheel on the opposite side. A 3/8″ corded or cordless drill then lifts the car up by pulling the ends of the threaded rod inward. As you might expect, you’ve got to drain fluids like fuel, engine oil, and washing fluids to avoid making a mess. This Eastwood exclusive can be had for $1,400.00 plus freight shipping. Wow. That’s just about all I can say. That looks terrifying to work around. It’s cheaper than a 4-post lift, but not by much. The cheapest 4-posters I’ve seen are around $1700, and would be a lot more useful IMHO. I’m not sure a cheap lift would be *less* terrifying to work around, and under, though. It does have the advantage of not needing as much overhead clearance, compared to any type of lift, though. For my money, I’d rather spend the extra on a lift and then get/make a rotisserie for underbody paint/work. I still have absolutely no idea how this thing works. And yes, if you’re going to drop $1400 on what amounts to a really fancy 2×4 (that appears to still require that you jack up the car at each wheel in order to attach this insane device), why wouldn’t you just buy four high-lift hydraulic jacks and bolt them to the floor? I’m pretty sure you could buy four 2,000-lb 36-inch jacks for a grand and a half (which saves you the cost of a large glass of whisky each time you want to use this thing to steady your nerves, as the trackback poster mentioned). It looks safe to me. I’ll bet the metal they bent to make those curves barely stretched out. And that one bolt at the pivot point looks plenty big – its gotta be at least a grade-5. Hey, I figured out why this is so expensive. It’s $400 for the materials, labor, and markup, and $1000 for Eastwood’s liability insurance premium. That would just scare the bejevious out of me to work with that lift. I think Chuck and Sean should get and tell us how it works. Rigs like this are pretty common in England, where space for a lift is rare. This gives way better access to the underbody for rust repairs and repainting than jacks. What happens to all the fluids when the car is tilted? This whole contraption bothers me…. You are supposed to drain all fluids first. I’d be worried about what kind of stress the wheel bearings are having to endure, what with having to bear the entire weight of the car at that weird angle. With a few tweaks, this would be a cool space saving way to store cars like record albums if you had as many cars as record albums. No room for lifts and double decker buses. Oh the irony.. I have a friend who works on everything from 69 Cameros to late-model 4-door sedans. He’s used something like this for several years and really seems to like it. I don’t know if he puts the old heavy Cameros on there, but it’s had everything from sedans to my old toyota pickup on it, to great effect. I don’t know if i’d use it for replacing a muffler, Ray, but for sandblasting rust off of frameworks and underbodies it works a treat! Needing to fabricate some custom cooling lines, I recently devised a method of doing the same thing with my car and I absolutely loved it! It is much easier to work this way than always having your hands over your head and craning your neck upward. If you have back trouble, this is a lifesaver. Any vehicle worth its salt will never have any problem with the weight bearing on two wheels. I would buy one of these any day over a 4-poster, with the caveat that a 4-poster can be used to double storage in a garage. I do agree that this thing could be useful for certain specific tasks. In fact for underbody welding it might be nicer than a lift because molten metal would not be dripping down your shirt collar as you weld. My sarcasm was directed at the thought of using this a general service lift replacement, which is the way the post sort of presents it. I would like the echo Podreczy’s sentiments. That’s just not natural. I think it would be good when you are restoring a car. When there is no engine, trans, and fluids in the car. The money this thing costs, you would be better off buying a lift. I know from experience that if you ever just need to pressure wash the bottom of a car that a 4 post lift would work just fine, but you get soaked and you end up being filthy dirty. I am anxious to try to use one of these in my detail business. Thats exactly what I was thinking?!? 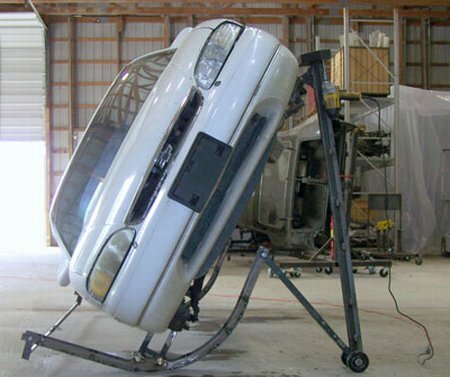 Sounds like a lot of wasted time just to get under the car… get a used lift. Its cheap.. and you dont have to worry so much about the car… its an interesting idea, just not practical. I agree with Ray. You shouldn’t have appoligized a bit. As far as the England quote I totaly disagree. These are practical in England because their cars are the size of our bicycles. Lifts are uncommon in England because people that do actual real work are uncommon in England. As an uncommon English people I think you guys are missing the point of the tilter. We use it for restoration work, welding sills (Rocker panels) on Mini’s and Morris Minors or similar vehicles is much easier on these. We dont drain engine or transmissions but do remove batteries and fuel tanks…but you don’t want those in a car when you are welding it anyway. It is not intended for a quick job like an exhaust. I just used this to sand blast and paint the bottom of my classic mustang. This works great. Eastwood doesn’t carry it anymore. Too bad! This baby works! I represented the company for three years and sold hundreds of them to satisfied customers. I can assure each and everyone who reads this post that the Liqui Vehicle Tilter is as safe to use as any floor jack, four post lift, rotisserie, etc. One only needs to remove three of the four tires and install the apparatus. It is completely universal to all makes and models of cars, trucks and vans weighing less than 6,800 lbs. Whether you have a four, five, six or even eight lug pattern, there are adapters to fit, including wheels with spindles. A 3/4″ drive drill powers the lift up and down into any position that is comfortable for you to work. It is completely stable, and will not tip over. I know this because I tried. Fluids can stay in the car, battery should be removed for safety purposes, but most of the people who will use or buy this tool is trying to restore a older vehicle, so most everything is already be removed. If your are a car enthusiast, this tool will make restoring your favorite car easy and fast. Work standing up or on a stool, no longer do you need to be lying on your back with your hand held up high. This type of lift is nothing new. The idea is simple. Change the cars center of gravity and putting all the pressure on the bottom bar. In fact, it is safer with the car tilted all the way up, then if it was a few inches on the ground. Think about it this way, when you tried to lift that long heavy object on its end, how much effort did it require to keep it tilted up, vs when you first lifted it? very little. As for the bearing comment, the bearings take more stress from street driving then simply tilting the car on its side. Also, fluid openings can be capped with something similar to rubber freeze block plugs preventing spillage. I bought my first Vehicle Tilter in 1992 from Canada. It works so well that I called the manufacturer in Germany and became the first dealer in the USA covering all of New England. I can tell you this is a solid piece of equipment. None of the doubts I have read here are valid. I must admit it is scary to think about but in reality it works great. I displayed it at the auto show in Boston back then and have used mine for 21 years now with no problems. Bare in mind though it must be used on a level solid surface. Where can I buy a Liqui auto tilter? Are you the NH dealer/distributor? Thanks, Bob in Groton, Ma. Twenty years ago when my buddies and I were young and immmortal we’d drop engines out of Beetles and then tilt the car up on two wheels and roll it forward (on two wheels) and then put it back on the ground. Easier than all the jacking of the rear of the car with the junky jacks I owned at the time. Once the car gets to a point around 50 degrees or so, one person can hold the car in place with one hand. This tool just makes this a controlled operation. Not like the car has any great urge to crash back on to it’s wheels again if you crank it up until the car is nearly balanced. Can anyone email me an owner’s manual for a Liqui Vehicle Tilter?